This easy-to-use rubric is already completed for you to just download and print! Students will utilize creative freedom to research diversity in the media. 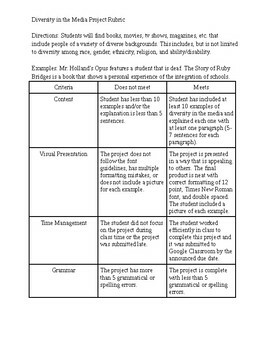 Students will be assessed based on content, work ethic, overall grammar, and more. Download this today for an easy project idea! *This resource could be used for a variety of courses including Teaching as a Profession, Psychology, Sociology, Literature, Social Studies, Character Education, Early Childhood Education, Special Education, Arts and Humanities, etc.